Fat has been a popular topic of discussion recently--as well it should be--because we have been led to believe for decades that fat is unhealthy, leads to heart disease and obesity, and is just plain bad for us. I’m going to clear up some of these issues. We need fat to survive, plain and simple. 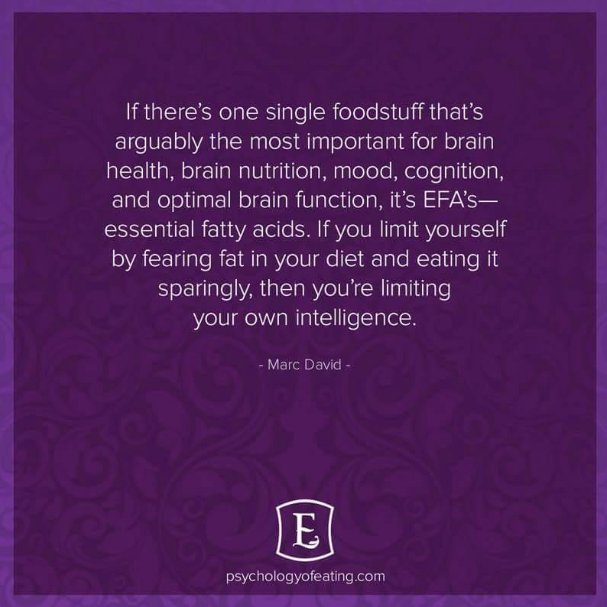 In fact, our brains are made up of about 60% fat, so even if you wanted to have all of the fat sucked out of your body, you’d be doing yourself a serious disservice as you would no longer be able to live! You might have heard about Essential Fatty Acids: these are also known as Omega-3s and Omega-6s. We’ve long been told by health officials to maintain a low-fat diet in order to remain healthy. Unfortunately, this was based on skewed research studies that weren’t thoroughly fact-checked for outside factors. Our government accepted these studies as true and, consequently, conventional doctors were taught to tell their patients to lead a low-fat lifestyle, especially if they were overweight or had heart disease. Around the same time, scientists hired by corporations selling grains and grain-based products led their own studies that showed how much our bodies relied on carbohydrates. This led to the outdated food pyramid I’m sure most of us were taught throughout school that had us eating 6-11 servings of grain/day. Luckily, this has been changed recently after years and years of research showing that it is, in fact, healthy fats that our bodies need the most. Healthy fats should make you feel fuller, which can lead to weight loss. They also can help speed up your metabolism. When you eat healthy fats, whatever isn’t automatically used by your body via your bloodstream is stored. While this might sound like a bad thing, it isn’t! As you’re not as hungry, if your body needs more fuel, it can unlock this stored healthy fat and use it. This is as opposed to what happens to sugar when it is consumed in the form of sweets or even just wheat and gluten: whatever isn’t used by your body while it’s in your bloodstream then gets stored into your fat cells, as with healthy fat. However, sugar turns into triglycerides, which then get trapped in the fat cells. So even though you have the fuel, your body can’t access it unless it’s broken down back into fatty acids! That means you feel hungry and have to go looking for something else to eat. The more sugar we eat, the more gets stored in our cells as unusable fuel--not what we want. Eating healthy fats can also increase your energy, balance your hormones and, incredibly, reverse heart disease. Suffice it to say, there are a multitude of benefits to making these part of your everyday diet. There are a host of books that go into more detail regarding these facts: Gary Taubes’s Why We Get Fat and What to do About It and Dr. Mark Hyman’s newly released Eat Fat, Get Thin are just a couple that I’d recommend if you’re the reading type. Now, I know that living with the belief that fat makes you fat can be a difficult one to overcome, but I suggest you experiment. Try incorporating more of the above healthy fats into your diet and just see how you feel. Listening to our own bodies is the easiest and fastest route to knowing what works, and what doesn’t work, for us! For example, I’ve tried using coconut oil multiple times in various dishes, but it just leaves me a bit gassy, so I don’t eat it despite all of the health benefits surrounding it. But for other people, I know it works very well. It’s really about how your body responds, not mine and not anyone else’s.